Here’s one from the wayback machine for us Midwesterners: Cincinnati-based broadcaster Paul Dixon was the toast of the airwaves in the tri-state area in the 1960s and early 1970s. Dixon’s show – which aired each morning on Channel 13 in Indianapolis – was a truly goofy local talk and variety show that revolved around Dixon, a self-styled dirty old man, and regulars like singers Bonnie Lou and Colleen Sharp. One of the things that most appealed to me, as a kid and young adolescent, was just how naughty the Dixon show seemed. As juvenile and silly as it was – and you can’t get much sillier than a wedding for rubber chickens or a middle-aged man parading around dressed like a baby – the show had a decidedly off-color edge. He would then choose a “winner” – usually a young Cincy housewife – and slip a garter onto her thigh, followed by a “knee tickler,” some faux jewel bauble that would hang below the hem of her skirt. Thus, tickling her knee. The whole process involved as much good-natured groping of the audience member as was probably allowed on TV at the time. Not to be forgotten: The T-shirt giveaway that entailed “Paul Baby” helping a woman into a tight shirt, donned over her clothes, that ended up looking like standing-up groping. For a lot of us kids, watching on sick days or during the summer, it all seemed like forbidden stuff. It sure as heck wasn’t run-of-the-mill daytime TV. 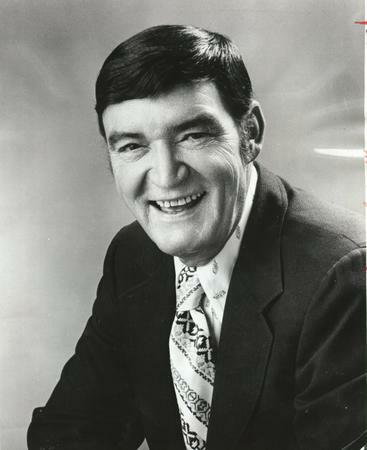 Dixon’s show aired on WLW-TV in Cincinnati from 1955 until shortly following his death in December 1974. While other local shows might have emulated Dixon’s oddball charm, it’s hard to imagine they duplicated it. And Dixon’s shadow was long. David Letterman, who has traditionally been as gracious as can be about the type of pioneering Midwestern broadcasters who came before him, like Johnny Carson, spoke to the Cincinnati Enquirer in 1997 and cited Dixon’s influences on his offbeat comedic choices, repeatedly maintaining that Dixon was funnier than he was. That’s not really the case. But Dixon was truly an original. This entry was posted in classic TV, Indiana, TV and tagged David Letterman, knee ticklers, Paul Baby, Paul Dixon, Paul Dixon show on September 11, 2012 by keithroysdon.